Cocoa and Lavender: Decisions. Decisions. 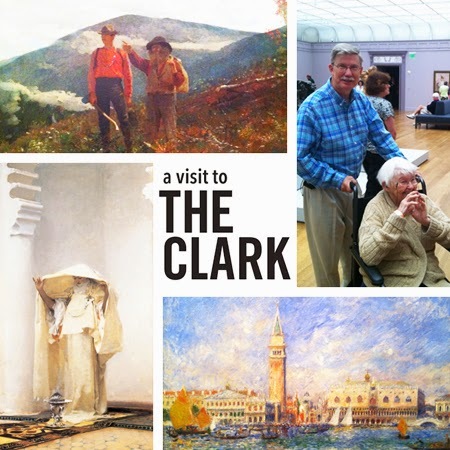 We took Dorothy to the Clark Art Institute; they have an incredible collection. Lenox is home to one of our favorite restaurants, Bistro Zinc, about which I wrote last year when I made the Coq au Vin. Since then, I read a post from my friend John Bek who writes He Needs Food in Sydney, Australia. He had taken a wonderful tour through New England that included Lenox. If you are touring New England, you really need to check out his series for great restaurant ideas! 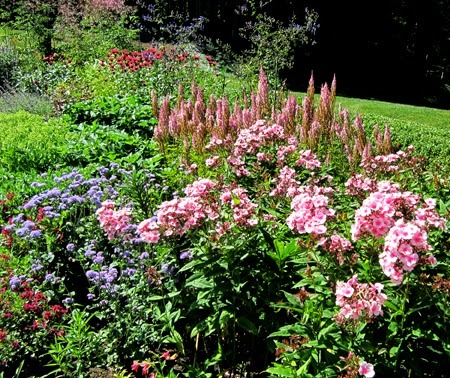 It was beautiful, fully in bloom, and redolent of floral fragrances and sweetgrass. 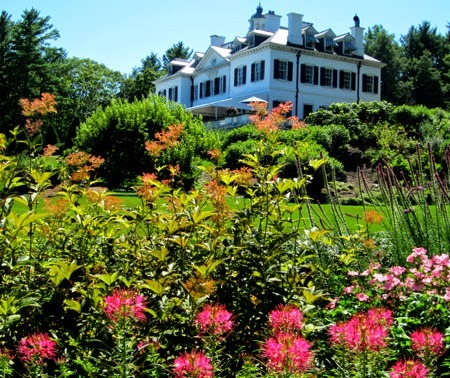 Note: This is not Markipedia's childhood home; it is Edith Wharton's summer cottage, The Mount, and is definitely worth a visit. Aside from needing food, John really knows food (and is an amazing photographer) so when he recommends something, I pay attention. 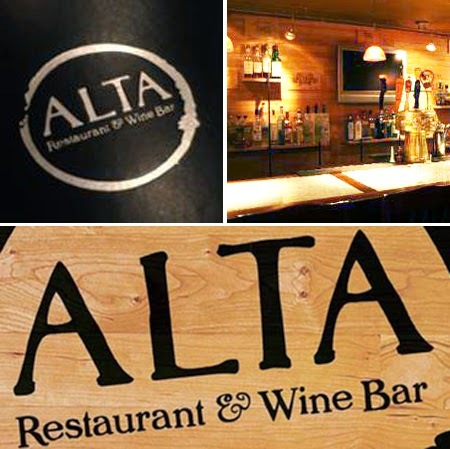 In Lenox he ate at Alta Restaurant & Wine Bar on Church Street, so we did as well. We were warmly greeted by the friendly staff (even without a reservation in high season) and were shown to the corner of the bar, as all tables were reserved. We didn't mind at all, as the server was wonderful and the bar itself beautiful. It was late-ish and we weren't up for a big meal, so we opted to split both a main course and a salad. I knew John ordered and loved their signature dish of duck with salted caramel sauce, and I was ready to order it myself. But then I spied the lamb tagine. I could easily have had the duck but, when I asked Mark if anything in particular tickled his palate, he said he had seen the tagine instantly and was unable to think of anything else. The decision was made. Alta’s Lamb Tagine is made with pomegranate molasses, dried apricots, and exotic spices, and is served with stewed vegetables over perfectly cooked couscous. It is a beautiful dish in every way. 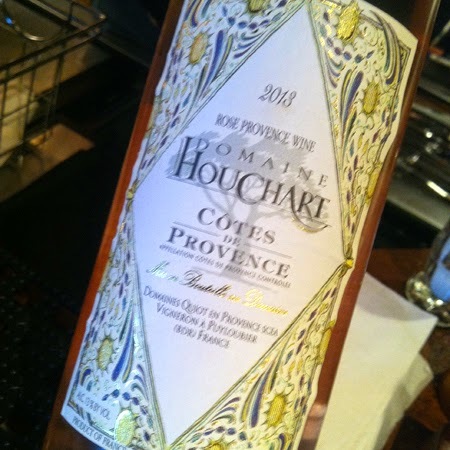 Our bartender/server, recommended a fantastic 2013 Domaine Houchart rosé from Provence. Mark opted for a gin and tonic made with Greylock Gin, make locally in the Berkshire Mountains. The Alta Salad is comprised of local mixed greens, Vermont goat cheese, kalamata olives, and tomatoes, all tossed lightly with a balsamic vinaigrette. The perfect ending. Sometimes decisions are difficult, but this decision had its benefits, too. Dave Pratt, the Assistant Manager, told me that the duck recipe was available and already in print through Edible Berkshires Magazine. The lamb, however, was not. I feel like we made the right decision. This wine was perfect with the lamb, but I don't think would hold up to the duck. I made the duck at home and we all loved it. The dark caramel sauce was not overly sweet, and was the perfect foil for the rich duck meat. I now pass the recipe on to you! Trim the excess duck fat. Season with salt and pepper (on both sides). 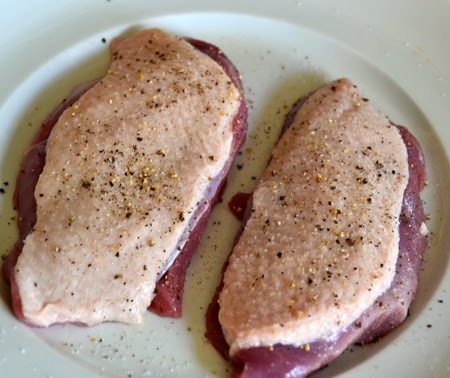 Pan-sear duck on fat side for 6 minutes on medium heat (4 minutes for smaller breasts); turn breasts skin side up and finish in the oven at 350°, 12–15 minutes for medium- rare (6-7 minutes for smaller breasts). 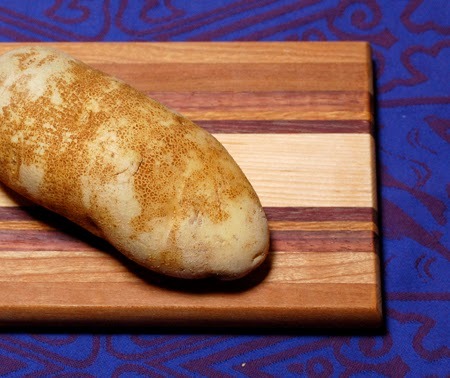 Cut the potatoes in quarters. Cover with cold salted water. When water boils reduce to simmer. 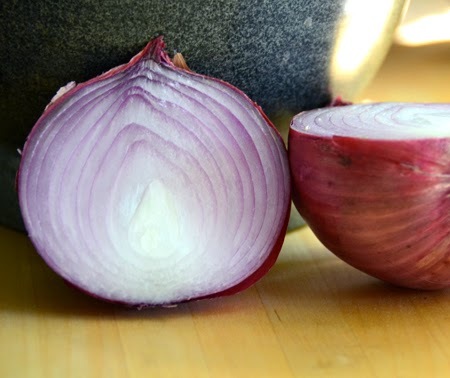 Cover pot, cook till fork tender 10-12 minutes. (Mine weren't tender until about 16 minutes.) Strain, return to pot, add cream, butter and mash the potatoes. Season to taste with salt and pepper. 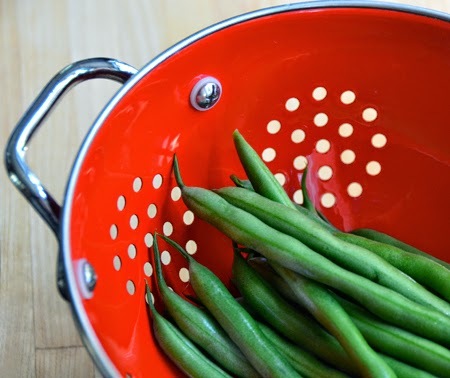 Boil salted water to blanch the green beans. Cook 3 to 4 minutes or until crisp-tender, chill them in ice water. Sauté onions in a little olive oil until tender. Add cherry tomatoes and green beans. Season to taste with salt and pepper. Combine sugar and water in an heavy-bottomed saucepan over medium-low heat. Cook until deep amber color, about 7–8 minutes. (I suggest a medium amber color.) Remove from heat. Whisk in salt. Quickly and carefully whisk heavy cream and milk into the caramel. 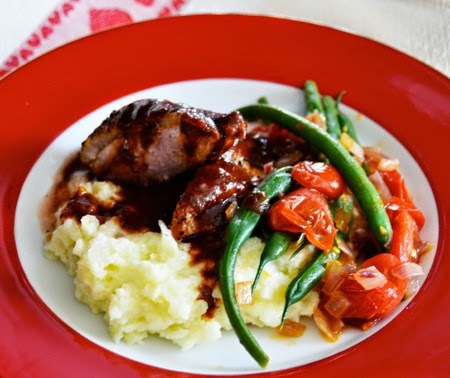 Arrange plate with mashed potatoes on the bottom, slice duck breast and place to one side, beans and tomatoes to the other side, all drizzled artfully with the sauce. "Artful" is in the eye of the beholder. NOTES: Actually, this is a fairly simple recipe with lots of moving parts. If you have kitchen staff, it would be a breeze. I recommend making the potatoes and beans first, and then reheating them just before serving. Have all the ingredients for the caramel sauce measured and ready to go. Once the seared breasts go in the oven, start the caramel. It will be finished at about the same tiem as the duck. Alta co-owner and manager Aurelien Telle was not there that evening, but graciously responded to my email after our visit, and had recalled John's autumnal visit. Aurelien first came to the United States almost 15 years ago. After finishing his studies at the famous Hotel & restaurant Management school of Thonon-les-Bains in France he decided to accept an offer as a Maitre D’ at the Wheatleigh Hotel - a sumptuous gilded-age "cottage" in Lenox - where he stayed for 4 years. He then moved on to be the General Manager of Spice in Pittsfield overseeing the operation of the restaurant. And in May of 2007 he embarked with his 2 business partners in opening Alta Restaurant & Wine Bar. Benjamin Daire, Executive Chef, joined the Alta team in October of 2011. He is originally from France and has an extensive culinary background having worked for some of the best French Chefs, such as Michel Rostang in Paris. Prior to his position at Alta, he was Sous Chef of (now closed) Spigalina Restaurant in Lenox. Benjamin takes a lot of pride in working with local farms and producers and changing his menu with the seasons. Assistant manager Dave Pratt holds a bachelor in Hospitality Management from the University of Massachusetts. He previously worked at the historic Red Lion Inn in nearby Stockbridge for many years before moving to Colorado. He returned and joined the team at Alta during the summer of 2008. In my office, we always wear pink on Wednesdays (Mean Girls, you know). 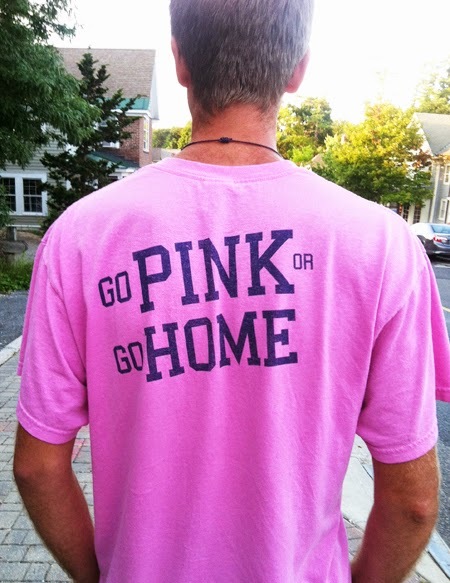 wearing pink to support his friends with breast cancer. We get it. Excellent, a great time had by All! I will admit I've never been one for duck but I love the sound of this dish particularly the sides! Oh and I visited Lenox & Stockbridge for the first time ever this summer - what a magical place! I am sure this would be really good with turkey or chicken, too. Oh, and quail! It really was a lovely meal we had at Alta, and I'm chuffed that the co-owner/manager recalls when we were there. Pity we couldn't stay in town longer. Thank's for the mention, David! I do love the sound of that duck meal! Thanks, Liz - it is really quite tasty! I like that, too, Valentina. Somehow it seems much more intimate - the whole idea of being alone in a crowd. I especially enjoyed that we had the corner of the bar. Hi David! This looks wonderful and so glad you had a great trip! I'm not much for duck, since I can't even really handle dark chicken meat! The salted caramel sauce on the duck sounds amazing though, great combo. I sent you an email about your post - glad you let me know it is there. I didn't get it, and it looks really good! Have a great week, and I hope you get this resolved. Ooohhh... the spicy-caramel cooked chicken sounds amazing. I would love that recipe! :) I am glad this brought back good memories for you of your Grandma! Hi David, the salted caramel sauce sounds amazing, as does all your accompaniments. Dinner at your house must be grand! 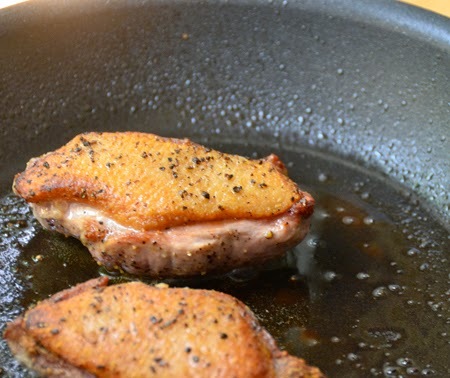 David, not only does this sound like a wonderful place to dine at but the recipe looks out of this world delicious as well - the only other recipe similar that I made before was for Caramel Chicken from Andrew Carmellini (I have one of his cookboks) - so I know this duck recipe must taste fabulous! How nice that you got to spend time with Mark´s mum! I will have to look fro Andrew Carmellini's cookbooks! That chicken sounds fabulous, too. Thanks fro that tip, Andrea! Duck w salted caramel sauce?! Thanks for sharing the recipe. Might try it w chicken this week. Oh, Colette - here I sit in a BLUE shirt today! I was just so tired that I completely forgot it was Wednesday. I will wear pink tomorrow just for you!! Sounds like you made the right choice: the tagine sounded amazing and looks like your reproduction of the duck turned out pretty darn fine too! That is so nice that you were able to spend time with Mark's mom.